Scoliosis is a back condition that affects many people throughout both civilized and industrial nations, and those that are considered third world. It is an abnormal formation in the spine; usually a curve that is different from the normal S-curve found in people, which is easily seen in a person’s posture when looking at them from the side. Scoliosis causes the spine to curve sideways rather than front to back or top to bottom. In more medical terms, it is defined as any lateral alteration of the spine of more than 10 degrees. This abnormal curvature of the spine can lead to unpleasant scoliosis pain, abnormal gait and other complications. There are mild forms of scoliosis, which affect a person in a limited way, and other more extreme types, which can bring on serious pain and debilitation as part of the list of scoliosis symptoms. Infantile Idiopathic Scoliosis – This type of scoliosis has only recently been recognized. It is exceptionally rare, and occurs in male babies more often than female. It happens between birth and three years of age, and affects the left-upper thoracic spine most frequently. Sometimes, curves that show up this early correct themselves as the child develops and requires no surgery or other intervention. Juvenile Idiopathic Scoliosis – This type of scoliosis occurs between the ages of 4 and puberty. Interestingly, the abnormal curve often shows in the patient as an upper right thoracic curve. In this type of scoliosis, female patients are affected five times more often than male patients. Adolescent Idiopathic Scoliosis – This type of scoliosis affects children from the ages of around 10 to 16. It most often shows as both a thoracic curve of more than 10 percent as well as spinal rotation. The good news is that of the many children who are diagnosed with adolescent scoliosis, only ten percent require surgery to correct the problem. Congenital Scoliosis– This refers to scoliosis that forms most often in utero – between the third and sixth week after conception. Since scoliosis pain is commonly an indicator of the disease in the former type, it is often diagnosed with commentary from the patient and x-rays, but since this type is formed while the baby is still in the mother’s womb, it may be necessary to take steps early if the disease is suspected. Physicians use three terms to describe the nature of the curve in congenital scoliosis patients. If the curve is lateral (left or right), then it is referred to as scoliosis. If it causes a rounded back, it is called kyphosis. If the curvature cases sway-back it is called lordosis. More than one type of curvature can occur within a single patient. 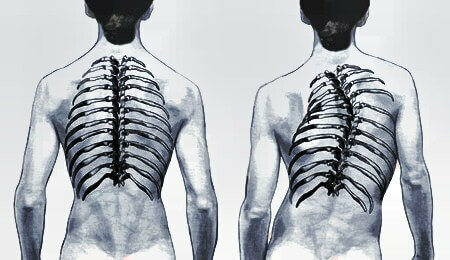 Furthermore, when scoliosis of the spine occurs, it often affects the ribs as well. The same way that vertebrae may fuse together, so may the bones of the rib, causing a hemi-vertebrae or other malformations which can lead to thoracic insufficiency syndrome, which means the thoracic cavity cannot develop due to insufficient space. Obviously, this can lead to problems with correct breathing for patients who have congenital scoliosis, among the many other physical and mental tribulations they must endure. Neuromuscular Scoliosis– This type of scoliosis is often caused as a secondary symptom of another disease. Diseases like spina bifida, muscular dystrophy or cerebral palsy can cause spinal weakness and deterioration, and eventually abnormal curvature. Spinal cord injuries that cause abnormalities on the spine are another form of neuromuscular scoliosis. Patients who suffer from neuromuscular scoliosis have some of the same concerns as congenital or idiopathic scoliosis, but since this form is a secondary issue to another disease, it can be even more difficult for patients to cope. In cerebral palsy, for example, not only are the bones of the spine and ribs affected, but the entire nervous system cannot function correctly, and there are often mental delays and cognitive functioning challenges. In the case of spina bifida (split spine, a congenital birth malformation) neuromuscular scoliosis is only one issue to contend with, since there is not only an abnormal curvature of the vertebral column, but the spine may be missing entire segments of bone or parts of the spinal cord may protrude form the body since it does not form correctly. Furthermore, even when neuromuscular scoliosis is caused due to spinal injury, there are often other considerations aside from curvature or fusing of spinal vertebrae. As mentioned, scoliosis can be mild or acute — scoliosis symptoms vary depending on the type and severity. Fortunately, there are many treatments and therapies for those who suffer from scoliosis symptoms. People who suffer from the disease can rely on non-traditional methods such as Acupuncture and Yoga, or more traditional methods such as scoliosis surgery. There are many scoliosis exercises aimed specifically at those who suffer from abnormal curvature of the spine, in order to stretch the surrounding muscle and encourage a lessening of the deterioration of the spine. Sufferers can try simple stretching exercises or more intense forms of therapy. People with symptoms so severe that they had to wear metal braces 24-hours a day, even while they slept, have found alternatives like taking a yoga class so beneficial that they gradually retrained their spines to curve normally. When these non-invasive methods are unsuccessful at stopping the further deterioration of the spine and other scoliosis symptoms, then surgery may be a last-course treatment. Many medical journals state that up to 40% of patients still have pain even after surgery, so other methods of management including physical therapy are ideal since many patients report still having to take pain medications in order to deal with their disease. Postponing surgery, however, can make it less effective since there are normally larger curves in place that must be corrected. Often, hardware used for bracing in this case, fails. Less invasive forms of surgery are being conducted using smaller incisions and less metal hardware, though, and when used in conjunction with alternative forms of scoliosis symptom reversal, can be quite successful.